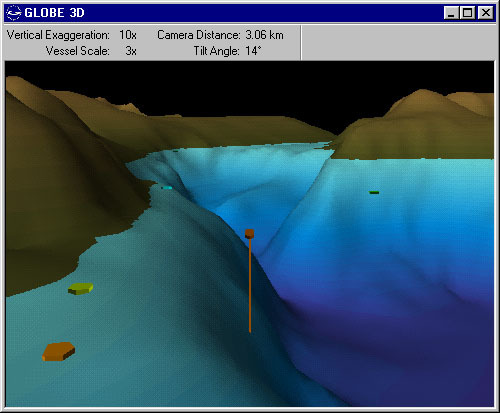 The advanced 3D imaging capabilities of GLOBE make it possible to visualize the ocean floor. The 3D display changes dynamically with the vessel or can be viewed at any angle. This view shows a vessel traveling through Chuginadak Pass. With the Terrain Builder add-on module you can use Terrain Builder data in combination with ECC supplied 3D data or by itself. As depth data is added to the terrain the 3D will update. The image to the right shows Terrain Builder data shown in the 3D module. This image shows live display of ARPA targets in a 3D view. The user can easily adjust the size of ARPA targets and their own vessel. The vertical exaggeration of the terrain models can also be adjusted. Additionally, with the GLOBE-AIS add-on, AIS targets can also be displayed.